. . . as a grateful recipient of Allison’s hands-on magic, I can say with utter conviction that the love that comes through her work is astounding. It is, after all, love that heals . . . I seek to understand you as a whole person, your past, your story, the way you view yourself, the way that you relate to the world, the vision you have for the future, and the changes you want to make. Along the way, I bring to the discussion aspects that are often overlooked, such as patterns set in embryonic and early development, patterns that affect breathing, fluid movement, and the physical and emotional response to stress. Although I engage in laboratory testing for your gut, adrenals, hormones, and food sensitivities, and I discuss dietary, fitness and lifestyle options to help recover from trauma, inflammation, and persistent stress, I always work within the larger framework of you as a whole person and what you are telling me. We work together to create an opening in your body awareness, for you to gain insight into the root cause of what is ailing you, with an emphasis on healing over fixing. Together we create a sensible plan to nurture inherent health and vitality, and together we expand the possibilities of joyful interaction with self and others. For me, this is the essence of health coaching, and this is the magic of Ask, Listen, Love. Allison’s work has transformed my life. Through her extensive knowledge of anatomy and acute intuition, she has helped me literally retrain my body. I now breathe in a whole new way, have much better digestion, and a whole lot more energy. I can’t thank her enough for the gift of health and quality of life. The Embryo explains why I work with children, and with the child that is also part of you. We’ve combined our Unwinding audio with the video demos to create a comprehensive healing experience. 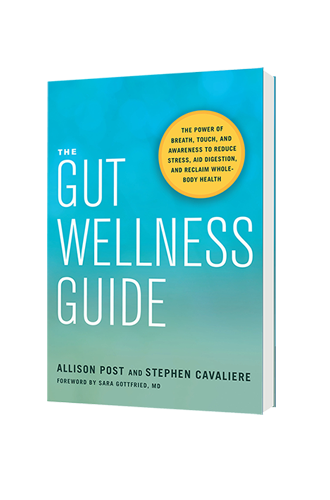 Cultivate a healthy and resilient gut for a joyful and vibrant life. Listen to— Mapping Breath with Allison Post—my March 29 interview with Andrea Nakayama on her 15-MINUTE MATRIX podcast show. Listen to my March 25th interview with Dr. Steven Gundry on his podcast or on Youtube. Listen to my March 21 interview with Chris Kresser on Revolution Health Radio. ©Allison Post and Stephen Cavaliere. All rights reserved.